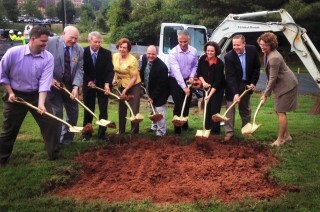 Ground Breaking for Manassas Senior Center Expansion | Hubert Construction, LLC. Immediately following a ground breaking ceremony, Hubert commenced construction on the expansion of the Manassas Senior Center, operated by the Prince William County Agency on Aging. The project, contracted through Elm Street Development, is a proffered improvement, to the facility, a result of a rezoning, completed several years ago and is a collaborative effort of the developer and both Prince William County and the City of Manassas. In attendance for the ground breaking ceremony were Prince William County Board of Supervisors, Jeanine Lawson, Maureen Cadigan, Martin Nohe, John Jenkins and Chairman Corey Stewart, along with the Mayor of Manassas, Hal Parrish. The expansion of the facility built in the 1980’s adds a multi-purpose room and includes renovations and upgrades to the buildings existing restrooms as well as adding a fire protection system to the entire facility. The facade of the addition will match the existing building. Construction of the much anticipated expansion is expected to be completed in December of 2015.